For decades scientists have been intrigued by the variety of sounds emitted by sperm whales, partly due to a popular theory that suggests that the sounds might contain information about the animals' size. But historically it has been extremely difficult to demonstrate that these curious clicking noises can reveal information about the physical characteristics of the massive marine mammals. Now, researchers at Scripps Institution of Oceanography at UC San Diego are unlocking some of the mysteries of sperm whale sound production. In a paper published in the May issue of the Journal of the Acoustical Society of America, Delphine Mathias and Aaron Thode of Scripps Oceanography for the first time describe a direct comparison between sperm whale clicking sounds and the physical features of the animal's head, including its size and internal organ structure. The study provides a glimpse into a possible new approach for investigating the biology behind marine mammal sounds and perhaps more accurately counting their populations. The roots of the unique study began years ago in Alaska, after sperm whales developed the ability to steal black cod off "longlines," deep-sea fishing gear that features a main fishing line draped across the ocean and fastened with shorter lines bearing baited hooks. Frustrated black cod fishermen began to realize that their longline fishing boats were attracting groups of whales—which typically forage alone— to their longlines, somehow alerting the animals like a dinner bell. To help fishermen and scientists better understand this behavior, Scripps researchers deployed acoustic recorders on longlines in 2004 off Sitka, Alaska, as part of the Southeast Alaska Sperm Whale Avoidance Project (SEASWAP). The results helped identify the sounds that attract whales to the fishing vessels. 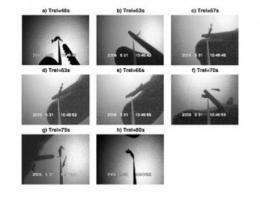 Encouraged, the researchers added video cameras to the fishing gear in 2006, which led to some unexpected results. 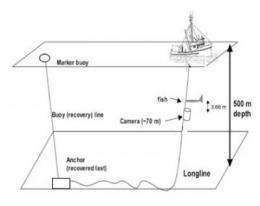 The resulting video, recorded using ambient light at 100 meters (328 feet) depth, not only successfully gave the fishermen a clear idea of how the thieving whales were stealing the fish—they pluck the line at one end to jar the black cod free at the other end, somewhat like shaking apples from a tree—but it gave scientists a chance to match the animal's acoustics with video depictions of its physical features. Sperm whales typically dive to dark depths spanning 300 to 2,000 meters (984 to 6,500 feet) to catch prey, making it virtually impossible to capture such activity on video. The fact that the animals produce foraging sounds at such shallow depths around fishing vessels is the main reason the Alaska footage is so unique. The clicks emitted by the whales are produced more rapidly as they approach their targets of interest and are among the loudest and most intense sounds produced by any animal, according to Thode, an associate research scientist with Scripps Oceanography's Marine Physical Laboratory. "The sounds can be louder than a firecracker," said Thode. "But until this video recording was made, scientists had not been able to get a direct measurement of the size of the animal and the foraging sounds at the same time." The Alaska video allowed Mathias and Thode to not only match the size of the whale's head with its acoustic signal, but permitted them to infer the size of its spermaceti organ, which produces a white, waxy substance previously used in candles and ointments, as well as the so-called "junk" inside the whale's head. The junk is a large organ that is believed to play a role in transmitting sound from the whale's head. Thode said the study could be a first step in the broader use of acoustics to census whale populations as supplements to visual counts of the animals. Currently it is difficult to relate the number of whale sounds recorded to the number of animals present. The ability to tease individuals apart acoustically would be a basic step toward solving the problem. "It's interesting to see if you can identify an individual animal from its sounds and that's something people have been fascinated by for a long time," said Thode. "Humans can recognize individual people over the telephone using features of their sounds, but it's been quantitatively very difficult to do this for individual animals." Thode said the video also may assist fishermen in reducing sperm whale encounters with their gear. Besides being economically damaging, the encounters are potentially dangerous to both humans and marine mammals due to the possibility of entanglement. Thode said the video recording has encouraged the U.S. National Marine Fisheries Service to start deploying acoustic recorders during black cod surveys off the Alaskan Coast to measure the scale of the sperm whale problem. Can we see a link to this video? They still haven't figured out what attracts the whales, though?